Ares | Learn about Greek Mythology,Greek gods,Greek mythology stories! Ares is the god of war in Greek mythology, son of Zeus and Hera and his sister was Eris. Because of his special warlike nature, several authors of the 19th century claimed(without any proofs) that he was foreign god, and considered that the Greek imagination couldnt have created such a savage god.In the myths Ares appears warlike and defiant and represents the impulsive nature of war. He had two sons, Deimos and Phobos, who gave their name to the respective satellites of planet Mars. 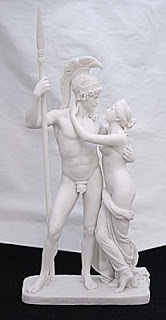 God Ares participated in the Trojan War on the side of the Trojans.He had a love affair with the goddess Venus,which was discovered by her husband, god Hephaestus. Thanks to his son Oinomaos from Steropi,Ares became ancestor renowned persons such as Atreus, of Thyestes, Agamemnon, Menelaus, of Aegisthus, Orestes, Electra, Pylades, the Pittheus Theseus, Hippolytus of Iphigenia, the Demophon, the Akamas, Eurystheus, of Amphitryon, Alcmene, Iolaus, Heracles, of Admetus, Kopreus, the Alkathoou and Ala of Telamon.From his daughter Harmony he became ancestor of the descendants of Cadmus, who are the god Dionysus, the monster Sphinx and famous figures such as Semele-Thyoni, Ino-Leukothea, Pentheus, the Aktaionas the Melicertes-Palaimonas, Laios , Oedipus, the Oinopiona, the grapes, and Thoas Anios. From Thestios Ares became ancestor of Althea, Lida, of Meleager, Deianeira's of Tydeus, Diomedes, of Helen, Clytemnestra, and the Dioscuri Amphiaraos. From Flegya was ancestor of the god Asclepius.